This portrait is part of the USAID Vietnam Clean Energy Program’s series on women champions in the Vietnamese construction sector, featuring women who have made strides in this male-dominated field, coming from diverse backgrounds and with different interests, but bound together by the common themes of a strong work ethic, love of country, a strong belief in themselves, and a passion for their work. Ms. Vu at the policy dialogue on urban housing between urban poor communities and the National Assembly in 2014. For Ms. Vu Thi Vinh, studying construction at the Hanoi University of Civil Engineering in 1964 was an honor. The entrance exam was tough and few girls were interested in studying technical subjects at that time. As an excellent student and graduate, she decided to be a lecturer and associate professor at the Hanoi Architectural University’s urban architecture department and thought it would be her lifelong career. Currently, the 69-year-old is praised not only as a distinguished teacher but also an admired leader in the construction management and urban development sector. After obtaining her Doctor of Science at the Hanoi Architectural University in 1996, Ms. Vu became its Vice Rector. 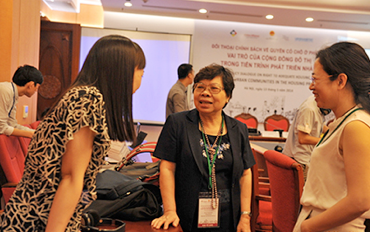 She retired from the university in 2003 and took the role of Vice General Secretary of the Association of Cities of Vietnam (ACVN) until 2013. She then became the General Secretary of ACVN till 2015. At ACVN, she partnered with several government agencies including the Ministry of Construction to promote urban housing development. She managed projects upgrading urban infrastructure throughout Vietnam and promoted linkages among national and foreign cities until she left the organization in 2015. She is now a regular guest speaker and trainer working alongside other programs, such as the USAID Vietnam Clean Energy Program and the United Nations Human Settlements Program, to promote green buildings, energy efficient construction, housing development and urban planning development to municipal leaders nationwide. As a speaker, she provides recommendations and lessons learned from other cities’ experiences to help trainees address similar situations and difficulties in their urban jurisdiction. “My life has been devoted to urban development. I want our cities to improve and grow socially, environmentally and financially sustainable, like others in developed nations,” she said. Ms. 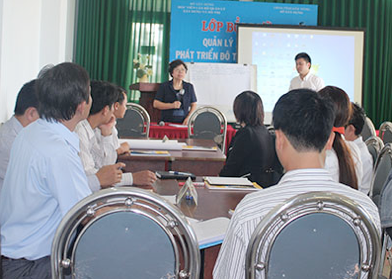 Vu speaking ate a training course on construction management and urban development for municipal leaders in Central Vietnam. During her 47 year career in the sector, Ms. Vu has led and provided technical support to many urban-related projects throughout Vietnam, such as lighting improvement, the evaluation of climate change impacts on urban areas, drainage management, waste treatment and transportation development. She has also worked on promoting the roles of municipal leaders, women and other community members on urban management. “Local authorities play an important role in each city as they decide whether a project is effective or not. If leaders are open for improvement, the public will trust them and their cities will develop successfully,” she said. Ms. Vu believes that Vietnam is going in the right direction in highlighting and promoting sustainable cities and communities as the country learns Sustainable Development Goals, introduced by the United Nations. “We are on track as we concentrate on sustainability in urban spaces including green buildings, traffic and other infrastructure. We will destroy the environment if we don’t consider long-term development,” she said. Green buildings have emerged as an interest in Vietnam and are affecting municipal authorities’ planning, management and development, according to Ms. Vu. “To make the public focus on green buildings, the government should issue and implement policies on promoting the issue. For example, if we want apartment blocks to be installed with solar panels to reduce electricity consumption, the government should give incentives to such projects,” she pointed out. Ms. Vu has won numerous awards throughout her career. In 2001, she received Vietnam’s second-class Labor Order award for her role as an educator. In 1998, she was awarded with the honorable Meritorious Teacher title. In 2004, she was honored with a medal from the Canada University of Montreal for promoting and leading collaboration between the foreign university and the Hanoi Architectural University on urban development. However, she went through some tough times throughout her career, before succeeding. One of the most difficult times was when she held the position of vice rector at the architectural university. “My thoughts and ideas were not taken seriously because I was a younger woman and had lower qualifications than other leaders on the management board. I was under pressure but did not give up. I decided to pursue a doctorate degree to extend my boundary knowledge and prove my qualification to get my male colleagues to respect and listen to me,” she said. After receiving a PhD in engineering in 1996, Ms. Vu proved she was a strong leader. With her determination, decisiveness and flexibility, she always encouraged teamwork among everyone she worked with and led the university to be one of the most reputable ones in Vietnam. Ms. Vu has also succeeded in balancing her work and family life as she considers her family the greatest motivation and encouragement to her professional career. She lives with her husband, who is a professor and architect, and two sons: the elder is an architect and associate professor at the Hanoi Architectural University and the younger is a construction engineer.